Everyone knows there’s no shortage of fun family activities in the Oklahoma City metro area, but every now and then, even adults need to get away from the hustle and bustle. Thankfully, Oklahoma City offers a multitude of venues for adults to cut loose and have a great time. A night out at Dave & Busters will have you feeling like a kid again in no time. Enjoy a variety of adult beverages—the strawberry mango snow cones are our personal favorite – great food and an overall fun environment. There’s no shortage of games to keep everyone busy including billiards and shuffleboard, Fruit Ninja, Whack and Win and so many more. And with plenty of specials each week including Taco Tuesday, 1/2-price games Wednesday and Thirsty Thursday you can have a fun night with friends without breaking the bank. For a more intimate setting, discover the beautiful Oklahoma River aboard an Oklahoma River Cruise. A variety of trip options are available from four boarding locations - Regatta Park, Bricktown Landing, Exchange Landing and Meridian Landing. Special themed cruises including luau, bluegrass and haunt the river offer an exciting way to discover the Oklahoma River and enjoy a relaxing evening. Lower Bricktown offers countless ways to enjoy a night out with a group of friends or that special someone. Catch the final home game of baseball season as the Oklahoma City Redhawks take on the Albuquerque Isotopes at Chickasaw Bricktown Ballpark Wednesday, Aug. 27. Watch the summer’s hottest movies at Harkins Theater or enjoy a beautiful Oklahoma evening with a ride down the Bricktown Canal. RedPin offers a unique bowling experience you won’t soon forget. For live music enthusiasts, there’s no shortage of talent in OKC. The fifth annual Live Music on the Canal will take place Sept. 5-6. The event showcases the talents of more than 200 Oklahoma singers and songwriters on five stages in lower Bricktown. Music will be performed along the canal including the Main stage in front of Harkins Theater; Jazmo’s Bourbon Street Café, which will feature both indoor and outdoor venues; and the green space next to Wanda Jackson Way on the canal level. While you’re exploring Bricktown, don’t forget the many wonderful restaurants. We have a hard time deciding where to go – as lower Bricktown is home to so many wonderful places. From Mickey Mantle’s Steakhouse to In the Raw, KDs Southern Cuisine, Toby Keith’s I Love This Bar & Grill, Fuzzy’s Taco Shop and so many more, there’s certain to be something that whets your appetite. Art lovers rejoice! The 36th annual Arts Festival Oklahoma will take place Aug. 30 - Sept. 1 at Oklahoma City Community College. One of the top juried fine art and craft shows in the Southwest, AFO features works by hundreds of artists from 11 states who will be on-site to answer any questions you may have. With everything from hand-crafted jewelry to ceramics, photography, paintings, sculptures and more, there is sure to be something that piques your interest. While you’re here, take in the sights and sounds as Oklahomans showcase their dance and musical talents throughout the festival. The Oklahoma City Philharmonic Orchestra will even hold a free public performance as part of the event. And no festival would be complete with scrumptious fare including funnel cakes, foot-long corn dogs, Mexican, Greek, German and other ethnic specialties. Art lovers can kick off the weekend each Thursday at the Oklahoma City Museum of Art’s Art After 5. Enjoy a beautiful ambiance and spectacular view of the Oklahoma City skyline from the Museum’s roof terrace. Live music is provided each week. The price of admission includes all museum exhibits, so be sure to check out Gods and Heroes: Masterpieces from the École des Beaux-Arts, Paris featuring 140 paintings, sculptures, and works on paper dating from the 17th through the 19th centuries. The museum also features its permanent collection of Chihuly glass in Illuminations: Rediscovering the Art of Dale Chihuly. The exhibit contains more than 80 pieces of unique artwork, making it one of the most comprehensive collections of its kind in the world. No matter what your interests are, Oklahoma City offers something for everyone. Get out and explore each of the city’s districts; we promise you won’t be disappointed. Oklahoma City Redhawks vs. Albuquerque; 7:05 p.m.; Chickasaw Bricktown Ballpark, 2 S Mickey Mantle Dr.; 218-1000; ticket vary. Tasty Tuesdays; 10 a.m.; Myriad Botanical Gardens, Children’s Garden; 445-7080; Free. The Art of the Brick; Regular museum hours; Science Museum Oklahoma, 2100 NE 52nd St.; 602-3760; Regular museum hours. Art Movers- Mid America String Quartet; Noon; OKC Museum of Art, 415 Couch Dr.; Free. Oklahoma City Redhawks vs. Albuquerque; 7:05 p.m.; Chickasaw Bricktown Ballpark, 2 S Mickey Mantle Dr.; 218-1000; ticket prices and availability may vary. Formed in Stone: The Natural Beauty of Fossils; Regular museum hours; Sam Noble Museum, 2401 Chautauaugua, Norman; 325-4712; Regular museum admission. Gods and Heroes: Masterpieces from the Ecole des Beaux-Arts Paris; Regular museum hours; OKC Museum of Art, 415 Couch Dr.; 236-3100; Regular museum admission. Acoustic Thursdays; 6:30 p.m.; Ice House Plaza; 445-7080; Free. Photo Fridays; 10 a.m.; Children’s Garden; 445-7080; Free. H&8th; 7 p.m.; Hudson Ave., between N.W. 6th & 10th; Free. Reckless Kelly; 9:30 p.m.; Wormy Dog Saloon, Bricktown; 601-6276; Ticket prices vary. Tony Lucca; 8 p.m.; The Blue Door, 2805 McKinley; 524-0738; Tickets $20 in advance. Chess Saturdays; Noon; Myriad Botanical Gardens, Meinders Garden; 445-7080; $3 donation suggested. Chicago/REO Speedwagon; 7:30 p.m.; Downtown Air Park, 1701 S. Western Ave.; ticket prices vary. Gala of the Royal Horses; 7:30 p.m.; Cox Convention Center, 1 Myriad Gardens; 602-8500; ticket prices vary. OCCC’s 36th-annual Arts Festival Oklahoma; 11 a.m.; Oklahoma City Community College; 682-7576; Admission is free. Film at OKCMOA: “Dancing in Jaffa”; 2 p.m.; OKC Museum of Art, 415 Couch Dr.; 236-3100; $9 for adults. We in Oklahoma City have known for a long time that people can afford to live and buy homes here and that they can get a better house for their dollars than in most places. Now our secret is out, and you should know it, too. In a recent Page 1 story, The New York Times noted that people are moving to Oklahoma City, the 12th fastest growing city in the nation last year, in part because of the low cost of living. Read the story, and find out more about housing here and here. In recent years, Oklahoma City has seen a boom in downtown housing development. So many people are choosing to call downtown home – nearly 7,450 downtown OKC residents these days – that the population has fueled demand for a new school in the area. John W. Rex Elementary School, a $14 million investment in the heart of downtown, is welcoming its inaugural classes this Fall. If you want to live downtown, you’ve got plenty of choices and more to come, ranging from $784 to $2,250 per month for a one-bedroom housing unit; to $1,100 to $3,100 per month for a two bedroom/two bathroom unit. So far there are nearly 3,000 housing units in the greater downtown Oklahoma City area, which includes the Oklahoma Health Center complex, and the Greater Oklahoma City Chamber estimates that there are nearly 2,000 more planned or under construction. Downtown residents are within walking distance or very close to all kinds of arts, culture, fitness and sport opportunities, including the Chesapeake Energy Arena where the OKC Thunder plays, the Chickasaw Bricktown Ballpark and home of the Oklahoma City RedHawks, Civic Center Music Hall, Oklahoma City Museum of Art, Oklahoma River/Boathouse District, Bricktown, Red Earth Museum, American Banjo Museum, the Oklahoma City Philharmonic, the Myriad Botannical Gardens, Cox Convention Center and home of the Oklahoma City Barons, Oklahoma River trails, Downtown Library, Oklahoma City Memorial and Museum and area parks nearby. And there are more venues in the works, as well as ongoing infrastructure improvements, like a 70-acre downtown park, a new convention center, whitewater rafting facility, modern streetcar system, 50 miles of trails and senior wellness aquatic centers. Welcome to the neighborhood. You’re not alone in finding OKC’s vibrant downtown appealing. Find out more about downtown living here and Oklahoma City’s housing market here. While we’ve talked about downtown housing, there are plenty of other kinds of housing – and areas – for you to consider throughout the metro area. If you like older homes on tree-lined streets in Oklahoma City’s core, you could move to one of the city’s more historic neighborhoods, like Crown Heights-Edgemere Heights just north of downtown; Edgemere Park, developed in 1926, or the Paseo neighborhood surrounding the Paseo Arts District, among others. Suburban neighborhoods to the north, west and south Oklahoma City offer a variety of schools and a mix of older and newer homes. You can live in the suburbs and still take advantage of the city’s low commute times and its action. And if you are into bigger lots and more room to roam, look at the pastoral neighborhoods to the west, in far northwest Oklahoma City, in Surrey Hills, Piedmont and Deer Creek; or to the east east at Midwest City, Choctaw, Jones, Nicoma Park and Lake Aluma. And of course, here’s more about Oklahoma City’s urban neighborhoods, which include downtown. Explore more about Oklahoma City’s housing on A Better Life OKC’s housing website. If you find yourself in downtown Oklahoma City with some time to explore, don’t miss the chance to stumble upon some places that you haven’t seen before. For ideas, check out the downtown walking tour from the Oklahoma City Convention and Visitors Bureau or go to Downtown OKC’s website to find various ways to make your time downtown interesting, special and fun, no matter what your interests are. From Downtown OKC, you can get the most out of your visit downtown by checking out itineraries for going on a date, listening to music, enjoying some family time or participating in health and fitness activities. While you’re downtown, stretch your wings a bit and see many of the sites close by, such as those in Bricktown, Automobile Alley, Deep Deuce, Film Row, Stockyards City and the Boathouse District. Dolphins IMAX; Regular museum hours; Science Museum Oklahoma, 2100 NE 52nd St.; 602-3760; ticket prices vary. Way Back Wednesdays at the Zoo; Regular Zoo hours; Oklahoma City Zoo, 2101 NE 50th St.; 424-3344; $1 admission for everyone. Art Moves; Noon; Robinson Renaissance, 119 N Robinson Ave.; Free. Oklahoma City Redhawks vs. El Paso; 7:05 p.m.; Chickasaw Bricktown Ballpark, 2 S Mickey Mantle Dr.; 218-1000; ticket prices and availability may vary. Astronomy Nights in the Garden; 8:30 p.m.; Myriad Botanical Gardens, Great Lawn; 445-7080; Free. ZZ Top/Jeff Beck; 7 p.m.; Zoo Amphitheatre, 2101 NE 50th St.; 602-0683; ticket prices vary. The All-America Rejects; 8 p.m.; Frontier City, 11501 N I-35 Service Rd. ; 478-2140; ticket prices vary. Sonic Summer Movies: The Lego Movie; 9 p.m.; Myriad Botanical Gardens, Great Lawn; 445-7080; Free. Skyline Food Truck Festival; Car show starts at 9 a.m.; Downtown Air Park, 1701 S. Western Ave.; ticket prices vary. Charlie Robinson; 9:30 p.m.; Wormy Dog Saloon, 311 E. Sherdian Ave.; 601-6276; ticket prices vary. Oklahoma City Redhawks vs. Albuquerque; 6:05 p.m.; Chickasaw Bricktown Ballpark, 2 S Mickey Mantle Dr.; 218-1000; ticket prices and availability may vary. OKC Energy FC vs. Harrisburg City Islanders; 7 p.m..; Pribil Stadium, 801 NW 50th St.; 235-KICk; ticket prices vary. Arts Council of OKC’s Sunday Twilight Concert Series; 7:30 p.m.; Myriad Botanical Gardens, Band Shell; 445-7080; admission is free. Make-It Mondays; 10 a.m.; Myriad Botanical Gardens, Children’s Garden; 445-7080; admission is free. Oklahoma City and aviation go hand-in-hand. If you are new to OKC you might not fully appreciate how important the industry is to our current economy and our state’s history. You can’t talk about aviation in the Sooner State without first mentioning Wiley Post. First of all Post had an eye patch; that alone made him 72 percent cooler than he already was. Eye patch aside, Post first made headlines in 1931 when he and his navigator broke the record by flying around the world in just eight days (hey, it was 1931). This accomplishment made Post a national celebrity (on par with Charles Lindbergh). He had dinner at the White House and his own ticker-tape parade in New York City. Post decided to one-up himself in 1933 when he became the first person to fly solo around the world. More than 50,000 spectators greeted him when he completed his trip - and he got his second ticker tape parade in NYC. For most people, that would be enough accomplishment for a lifetime, but not for Mr. Post. He also developed one of the first pressure suits and discovered the jet stream (all while wearing an amazing eye patch). Today aviation is one of the key drivers of our region’s economy. It supports more than 85,000 workers and the production of $7.3 billion in goods and services in Oklahoma City alone. On a state level, aviation is Oklahoma’s top foreign export and accounts for a staggering 10 percent of our state’s economy. Oklahoma is one of the top 10 states nationally in traditional aerospace employment. One advantage to Oklahoma City’s central location is that it is pretty easy to get to just about anywhere in the U.S., whether by plane, train or automobile. If you have a long trip in mind, we recommend taking a plane (so you can get back to OKC quicker). Will Rogers World Airport (WRWA) is our state’s biggest and busiest airport, and it is located in Oklahoma City. In fact more, than 3.5 million passengers go through WRWA airport each year. Over the past couple of years, the airport has seen extensive expansion and renovations to improve travelers’ amenities with more to come. In fact, a $70 million renovation is currently in the planning stages. The project will expand the terminal, add three new gates, a new concourse and more. Also on the horizon (scheduled for Spring of 2015) is a $44-million car rental center. The new facility will accommodate up to 900 rentals and help free up parking space close to the airport. WRWA currently has 20 nonstop flights all over the U.S., so check the schedule and plan your next vacation. Just be sure to check often because new nonstop flights are added frequently! Tinker Air Force Base is one of the largest Air Force bases in the U.S., and is located right here in the Oklahoma City metro. Tinker not only plays a critical role in our nation’s defense, but is also a key economic driver for our region and state. The base houses the largest group of civilian Air Force personnel in the U.S. and is Oklahoma’s largest single site employer. More than 26,000 employees work at Tinker each day. As you would expect, Tinker covers a lot of ground to house that many employees. The base covers nine square miles and has more than 760 buildings with a floor space of more than 15.2 million square feet. The recent addition of the Air Force Sustainment Center (AFSC) has made the base an even bigger focal point of support for our Air Force. The AFSC is the center for all Air Force weapon systems, and provides crucial support to the warfighter through depot maintenance, supply chain management and installation support. A little history on the base: Oklahoma City was awarded the base in 1941 using land that was owned by the Greater Oklahoma City Chamber. Tinker Air Force base is named after U.S. Army Maj. Gen. Clarence L. Tinker. Tinker was a native Oklahoman who was the first major general of American Indian descent in U.S. Army history. He was also the first general killed in World War II. A little-known fact about Tinker: Rock pioneer and legend Buddy Holly actually recorded his hit song “Maybe Baby” (and couple of other tunes) in the Tinker Air Force Base Officer’s Club about a year and a half before his untimely death. You can read more about that here. We’ve talked a lot about Oklahoma’s aviation history and one place you can see aviation history come alive is the 99s Museum of Women Pilots. Named for the 99 women pilots who signed the original membership charter in 1929, the Ninety-Nines is an international organization of women pilots. Their museum, located near Will Rogers World Airport, celebrates the inspiring history of female aviators from Amelia Earhart to women of space. Speaking of Amelia, the museum houses a large collection of artifacts that belonged to the famed aviatrix. Buzzing Bees; 9:30 a.m.; Children’s Garden, Myriad Botanical Gardens; Admission is free. On Behalf of the Pioneers: The Oklahoma City Century Chest; Normal museum hours; Oklahoma History Center, 800 Nazih Zuhdi Dr.; 521-2491, Regular Museum admission. Gaming Club; 4 p.m.; Belle Isle Library; 5501 N. Villa; 843-9601; Admission is free. Children Reading to Dogs; 6 p.m.; The Village Library, 10307 N. Penn; 755-0710; admissions is free. Sonic Summer Movies Presents Stand By Me; 9 p.m.; Great Event Lawn and Band Shell, Myriad Botanical Gardens; Admission is free. Noon Tunes; Noon; Downtown Library, 300 Park Ave.; 231-8650; Admission is free. OKC Energy FC vs. Arizona United; 7 p.m..; Pribil Stadium, 801 NW 50th St.; 235-KICk; ticket prices vary. Bright Night of Star Wars; 6 p.m.; Science Museum Oklahoma, 2100 NE 52nd St.; 602-3760; admission prices vary. Sonic Summer Movies: Despicable Me 2; 9 p.m.; Myriad Botanical Gardens, Great Event Lawn and Band Shell; Admission is free. OKC Energy FC vs. LA Galaxy II; 7 p.m..; Pribil Stadium, 801 NW 50th St.; 235-KICk; ticket prices vary. LEGO Club; 4 p.m.; Midwest City Library, 8143 E Reno Ave.; 732-4828; Admission is free. This week’s theme is Science, and there’s no better place in OKC to start exploring what fun there is to be had in all things scientific than at Science Museum Oklahoma. Nary a youngster that grew up in central Oklahoma can’t boast fond memories of yelling in the echo tube, producing (sometimes questionable) ephemeral shapes on the shadow wall, taking a shake on the earthquake simulator, peering out the rooftop periscope and attempting to keep your watch away from that really strong magnet. But if you haven’t been to Science Museum Oklahoma since you were a kid (when you might have called it the Omniplex), you’re missing out on a lot of cool stuff. Besides a powerful planetarium, enthralling dome theater and sure-to-entertain Science Live shows (probably worth their own blog posts individually), other exciting exhibits await. Here’s but a sample to whet your acquisitive appetite: Destination Space lets you experience life as a Mercury astronaut. Wield the power of lightning at the Van de Graaff Generator at the Eye on the Sky exhibit. The Mind Games area proffers optical illusions to your eyes and brain. And what other indoor museum offers a Segway course? Learning about scientific principles can be fun, and nowhere is that more true than at Science Museum Oklahoma. Grab us some astronaut ice cream from the gift shop on the way out, will ya? If you’re like us, you’ve had enough TMZ, red carpet coverage, various Kardashians and Joan Rivers to last through the main sequence of a low-mass star. Get some real stargazing in for a change at Astronomy Nights in the Garden at Myriad Botanical Gardens. The OKC Astronomy Club will be looking long and hard at the moon, stars and planets above Oklahoma City on August 21 at the Great Lawn. If you have a telescope, bring it, but you don’t have to have one to see some stars and have some fun. Can’t wait for some space? The Gardens’ next Full Moon Bike Ride is August 10 at 8:30 p.m. Meet at the Band Shell with your bike, helmet and bike lights, and leisurely tour downtown under the light of the moon. Not enough science for you? Confidently boast that the pollination process is, in fact, your beeswax by attending Buzzing Bees. The Gardens hosts this session about our favorite honey makers in the Children’s Garden on August 12 at 9:30 a.m. Find out what all the buzz is about (sorry, we just had to go there). It’s that time of the year again. No, not when you’re watching your electricity usage from 2 to 7 p.m. like a hawk that is blessed with an exceptionally good awareness of the current state of the thermostat (though that may be the case as well). 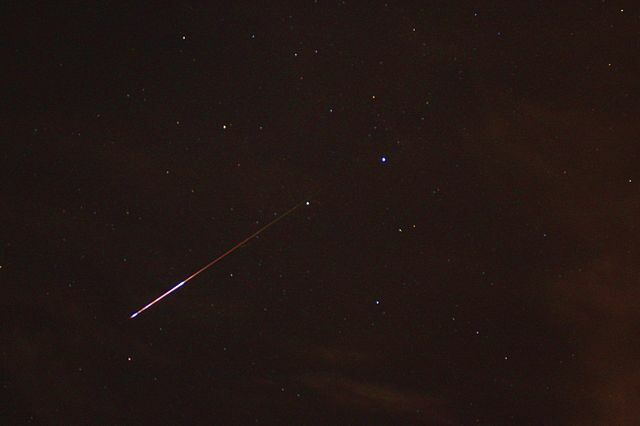 The Perseid Meteor Shower is once again upon us. The Perseids typically peak on August 12-13, but are visible from July 13 through August 26th. One of the awesome things about meteor showers is that no special equipment is required – just your eyes and a dark, clear sky. And the best thing? Free, courtesy of Mother Nature. Don’t ever say she never did anything for you! Oklahoman Tom Stafford commands Gemini 9-A in 1966, the 7th manned Gemini flight. We here at TBL HQ were enthralled with the recent “Oklahomans and Space” series on OETA. The documentary series (and book by Bill Moore, who also produced the shows) details the impact that Oklahomans have had, and continue to have, on the space program. From astronauts to engineers to mission controllers and more, Oklahoma lays claim to a remarkable level of accomplishment when it comes to exploring the final frontier. Archival footage and current interviews combine to make a heart-stirring, educational retelling of some of our nation’s greatest scientific and exploratory triumphs, by the Oklahomans that helped make them happen. If you missed the series on TV, fear not! The book and eight-disc DVD set are both available at the Oklahoma History Center Museum Store and online. Out of Bounds Comedy Competition; 8:45 p.m.; Othello’s Italian Restaurant, 434 Buchanan Ave.; 390-9045, admission is free. A Little Night Music; 7:30 p.m.; Civic Center Musical Hall; 201 N. Walker Ave.; 524-9312; ticket prices and availability vary. Sonic Summer Movies Presents Pitch Perfect; 9 p.m.; Great Event Lawn and Band Shell, Myriad Botanical Gardens; Admission is free. Rockstar Mayhem Festival; Gates open at 11:30 a.m.; Downtown Air Park, 1701 S. Western; ticket prices vary. Western Avenue: On the Lawn, Ladies Night; 5 - 8 p.m.; 62nd & Western; free admission. Oklahoma City Redhawks vs. Iowa Cubs; 7:05 p.m.; Chickasaw Bricktown Ballpark, 2 S Mickey Mantle Dr.; 218-1000; ticket prices and availability may vary. Live on the Plaza; 7 p.m.; Plaza District, 16th & Indiana; free admission. Free Summer Movies Series: Cloudy with a Chance of Meatballs 2; 8:30 p.m.; Chesapeake Finish Line Tower, Boathouse District; Admission is free. A Little Night Music; 8:00 p.m.; Civic Center Musical Hall; 201 N. Walker Ave.; 524-9312; ticket prices and availability vary. Oklahoma Victory Dolls vs. North Texas Derby Revolution/Denton County Outlaws; 5 p.m.; Oklahoma State Fair Grounds, 3001 General Pershing Blvd. ; ticket prices vary. Oklahoma City Redhawks vs. Iowa Cubs; 7:05 p.m.; Chickasaw Bricktown Ballpark; 2 S Mickey Mantle Dr.; 218-1000; ticket prices and availability may vary. James Taylor; 8 p.m.; Chesapeake Energy Arena, 100 W. Reno Ave., 602-8700, ticket prices vary. Downtown Dash; 8 p.m.; All around downtown; race is $35 to enter. Jurassic Park Outdoor Screening; 9 p.m.; Great Event Lawn and Band Shell; Myriad Botanical Gardens; Admission is free. Jake Jam w/ Eli Young Band & Stoney LaRue; Concert starts at 2 p.m.; 2 East Reno, Bricktown; tickets are $10. Oklahoma City Redhawks vs. Iowa Cubs; 6:05 p.m..; Chickasaw Bricktown Ballpark; 2 S Mickey Mantle Dr.; 218-1000; ticket prices and availability may vary. Fall Out Boy/Paramore; Gates open at 5 p.m.; Zoo Ampitheatre, 2101 NE 50th St; 602-0683; Ticket prices vary. Oklahoma City Redhawks vs. Iowa Cubs; 7:05 p.m..; Chickasaw Bricktown Ballpark; 2 S Mickey Mantle Dr.; 218-1000; ticket prices and availability may vary.